New Delhi: To a stranger, Prakash Karat and the organization he leads, the Communist Party of India (Marxist), would seem like anachronisms in the roaring capitalist economy that is India today. But quite improbably, by seizing on India’s deepening friendship with the US, Karat and his party have lately emerged as a sharp and dangerous weapon against the coalition government, making it plain that although the Communists do not have the strength to rule India, they have the power to spoil the plans of those who do. India’s electoral math makes it impossible for Prime Minister Manmohan Singh’s coalition government, which is led by the Congress party, to govern without the backing of its Communist allies, principally Karat’s party. 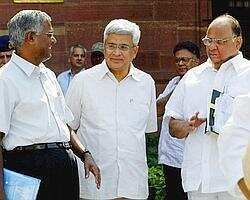 And so, if Karat carried out his veiled threats to withdraw support, the government could not continue, and fresh elections would have to be called before its five-year term expires in 2009. In a vague bit of sabre-rattling, Karat has threatened “serious consequences" if Singh’s government advances its negotiations on its nuclear deal with the US. He sees it as a part of a strategic alliance with the US, intended to increase American weight in Asia—and he wants none of it. “We don't want to be another Japan," Karat said. “It’s not in our interest." The nuclear accord, initiated by the Bush administration, approved provisionally by the US Congress and described as a centrepiece of a new relationship between the countries, would allow India to buy nuclear technology to generate energy. It would require India to negotiate separate agreements with IAEA and the 45-member Nuclear Suppliers Group (NSG). The Congress party seems to be rolling up its sleeves for a battle. The fourth-generation scion of the Gandhi-Nehru dynasty, Rahul Gandhi, was recently elevated to one of 11 general secretaries of the party. His mother, Sonia Gandhi, the party chairwoman, said on Sunday that those who opposed the deal were “enemies" of progress. “We need not surrender our vital interests to America," the Leftist parties roared back on Monday in a statement. Government officials have contended that the nuclear deal does not signify the surrender of an independent foreign policy, an assertion that seems to have been borne out most recently with respect to Myanmar. India has cultivated good relations with Myanmar’s military rulers, and in contrast to American calls for sanctions, it has said little about the latest crackdown on anti-government protests, except to gently suggest a investigation into the killings of protesters. Oddly, Karat’s group has been closer to the American position on Myanmar in that it has urged greater pressure on its military rulers. He is fond of excoriating American policy in Iraq and equally fond of highlighting India's traditional strategic and cultural links with Iran. It was the nuclear deal that had prompted Karat’s most ferocious threats against the government and not a host of issues that might be expected to anger the Communists, such as the dismal statistics on child malnutrition in India or the poor state of the country's public health system. The Communists, long a part of the Indian political fabric, have rarely wielded as much influence as they have in the past three years as the government’s allies. They have been blamed for blocking further liberalization of the economy, including the entry of foreign retail chains, for putting the brakes on proposed changes in labour laws and for opposing the nuclear deal on the basis of a lingering Cold War mindset. “There is a knee-jerk anti-Americanism," said the historian Ramachandra Guha. “In some sense they can’t forgive America for having won." Guha also took pains to credit the Communists for having been less corrupt than other parties and for preventing violence against religious minorities in the states they have controlled. Such violence has engulfed many other places across India. The Communists are buffeted by ideological disagreements of their own, with Karat beating an anti-American drum, while his comrades in West Bengal, a state governed by the Communists, woo American industry to revitalize a sagging economy. That state-led industrialization drive—call it the Bengal Communists’ more hammer, less sickle policy—has invited violent peasant protests, and some say it has weakened the party’s hold on one of its two key states. Kerala is the other. The party holds 43 of 545 seats in Parliament, and forcing elections soon would not necessarily improve its standing. Whether realpolitik will trump ideology remains to be seen. Karat, at any rate, casts himself as an ideologue. “We’re not going to come into power," he said flatly. “We may win seats. We may lose seats." For the government, Karat represents only one kind of Communist worry. India has another set of Communists: the Maoist guerrillas, uninterested in elections but increasingly, and violently, active to varying degrees in 13 of 28 states. The Prime Minister has described these Communists as India's biggest internal security threat.